Of the positive events for hitters, home runs and infield hits are polar opposites, and not just in terms of impact. The home run is the realm of the beefed-up slugger, the lumberers. The infield hit is reserved for the wisps, the sprinters, the scrawny slap hitters. Unsurprisingly, there is a weak negative correlation between home runs and infield hits on a per-plate appearance basis — I found a minus-0.45 correlation coefficient between the two for all hitters with at least 1000 plate appearances between 2008 and 2012. With over 100 home runs and infield hits since 2008 — 20 per season of each — Ryan Braun, Adam Jones and Hunter Pence find themselves in a class of their own. Although most fans should be somewhat aware of the speed of this trio, their star power — as with most hitters — comes from their power. Braun, Jones and Pence make up three of the 56 players to hit 100 home runs over the past five seasons. Of their 15 individual seasons, only twice — Jones in both 2008 and 2009 — has any of these players failed to hit 20 home runs. Consistent power, even without secondary skills, is usually enough to get people to take notice. Add speed, and the player becomes a spectacle. Only thrice has a player in this trio failed to steal 10 bases in a season — Jones in 2010, Pence in 2011 and 2012. Still, we generally don’t expect to see players with that kind of power atop the infield hit leaderboards. Consider those who join them in the top ten over the past five years: Ichiro Suzuki, Michael Bourn, Alexei Ramirez, Derek Jeter, Shane Victorino and Juan Pierre. These players, particularly Ichiro, Bourn and Pierre, are much more typical examples of who I expect to see legging out infield hits. Unlike most power hitters, none of the Braun-Pence-Jones trio can be classified as a fly ball hitter. Only Braun in 2008 posted a GB/FB under 1.0, and although this may limit their power output, their speed allows them to post higher batting averages (helping their on-base ability) than most power hitters. Pence owns a .313 BABIP, Jones owns a .316 mark and Braun checks in at a stratospheric .337. Ground balls already go for hits more often than fly balls by nearly a two-to-one margin (.238 to .131 in 2012); adding on 20 infield hits per season only exaggerates the disparity. Of the 56 100-homer hitters over the past five years, just 20 notched a BABIP above .310; Braun’s .337 BABIP trailed just Miguel Cabrera, Matt Kemp and Joey Votto. The speed half of the combo hasn’t necessarily manifested itself in defense. 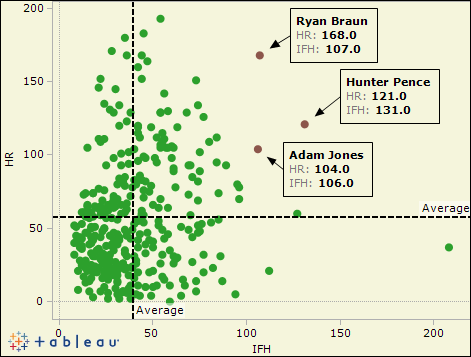 Braun has improved since shifting to left field, to his credit, but is still just a roughly average corner outfielder. Pence’s coordination issues have similarly limited him to an average corner outfielder. Although Adam Jones passes the eye test for me (and others) in center field, his game hasn’t been appreciated by the metrics. Still, these three players have combined for nine all-star berths and 60.6 WAR (over 12 per year) since 2008. It shows the extreme value players who contain multiple skillsets — especially skillsets that are seemingly diametrically opposed — can offer a team, and few players demonstrate it better than Braun, Pence and Jones. We hoped you liked reading The Unique Power-Speed Combos of Braun, Pence and Jones by Jack Moore! Would love to know 5-10 others in the top right quadrant!